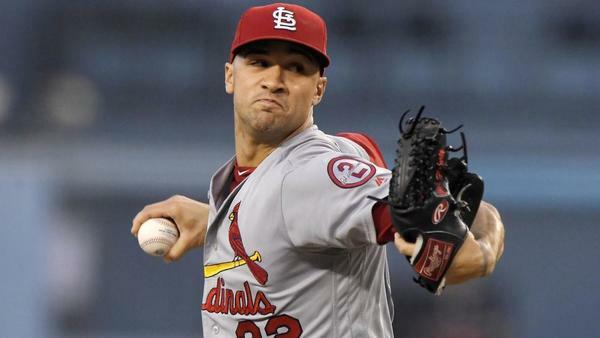 Bring your Cardinals questions and comments, and talk to Post-Dispatch baseball writer Derrick Goold in a live chat from Jupiter, Fla., at 1 p.m. Monday.. Anything is possible. This just seems like a lot of effort. Twitter and elsewhere likes to paint front offices as some kind of evil geniuses with these elaborate Ernst Stavro Blofeld designs to send people off the scent while really doing what the fans really, really, really want. If only. Even the front office would say that gives them too much credit. Sometimes a duck is a duck and disinterest is disinterest -- not poker. Aside: They haven't made many public comments at all on these subjects, but at some point in the coming week clarity from the front office would make a lot of sense, and that should be a public comment. On another topic: The Marlins are begging their fans for "another chance" and to "trust us." My question is, why should they? That fan base has been jerked around more than any other in baseball. They have more World Series titles than the Cubs over the last 25 year, yet each win is met with an immediate tear down. Even when they don't win, they instantly do away with anyone with talent (Stanton, Ozuna, Yelich, Realmuto, Gordon). Do you see Miami as a long-term home for baseball, or will that monstrosity of a stadium meet and early fate? Baseball has a future in Miami. It would be a shame if the new owner doesn't mend the rupture created by the former owner -- who put a good market on the brink of being without baseball. The new owner should get a chance to build the team they want, and let's hope that is a team that a market like Miami deserves. Baseball should thrive there, in my opinion. Don't leave us hanging... how has Shildt's camp looked different so far than under Matheny? I would hope that you could see it from the way the players are talking -- in print and in social media. Or that you would notice it from the coverage of the Winter Warm-up and all of the things Shildt has done already this winter to reach out to players, communicate with players, and keep players in the know with what the team is doing. Check out the number of big league everyday players who are already present at camp. Marcell Ozuna is here. How did that conversation go? Paul Goldschmidt is here to get to spend time with other infielders, and Matt Carpenter said some of them are here because they've been energized by the tone that Shildt has already set, and that staff has helped convey. There is a bounce to the staff to that may not be as obvious from the outside -- but from someone who has been around so many of these camps, it's clear that the staff things it has a good program coming for spring and that they enjoy working together. There is a clear crackle of collaboration, and you want chemistry? That's where it starts. Longtime readers and observers of the team will trace some of the issues the Cardinals had to the "spring of discontent." That name for spring training came from an article in The Post-Dispatch about the fraying of the clubhouse, the poor play, and the problems the Cardinals were trying to stop then and there before they leaked into the season. Well, they did. And they leaked into the next season. We're not seeing some of those issues linger. Would the new proposal requiring relief pitchers to face three batters all but eliminate lefty specialist relievers? No, it would just spawn more soccer-like injuries on the mound. Great. Swell. Cannot wait for the Dodgers to perfect that ruse. Fowler works with a personal trainer and a support staff that includes a nutritionist and such, so he's getting his work with them. He's expected closer to the report date for the position players, and that's not unusual for him -- or for a handful of players. In the past, you've advocated the "healthy scratch" approach used in hockey. Can you please remind me about the pros and cons? I cannot think of any cons to it at all. Only pros. There would be a standard 25-man roster for the game and thus no team would play with 33 players while the other team plays with 28 -- especially in the thick of the playoff chase through September. Plus, there would be, year round, three, four, whatever extra spots on the roster for teams to use and for players to accrue service time. Makes a lot of sense to me. Manny Machado shared a video of Chicago White Sox baby shoes on his Instagram story. And that is a sentence that 15 springs ago I never thought I'd type in a chat. Hand me some popcorn. Let's see how this plays out. Do you think its likely that there will no designated closer named by Schildt? I would put that as unlikely to start the season. They really seem to want to avoid that. Will we ever see Scott Rolen helping out during spring training? Maybe. He is a little busy with his role on the staff for Indiana baseball. I hope they keep Jedd and Jose M - what a strong bench that would be. Thoughts or insight? It could be tough to keep both of them and the spare pitcher for the bullpen, and it would almost impossible to keep both of them and Yairo Munoz on the bench. Something has to give, and that will be the Cardinals exploring some trade discussions about Gyorko at some point in spring, unless there is an injury that clears up a clear role/need for him. I'll trust your take on the staff having a lot of bounce, and certainly the communication aspect is noted and refreshing, but why is so much being made about players arriving early as if that's a new thing? I clearly remember reading articles from past seasons about how many position players were there a week or more before report date. The entire starting infield being here 11 days before they're supposed to be -- that's different. Marcell Ozuna being here 11 days before he's required -- that's different. That's also something that the Cardinals said they wanted to have happen and that Ozuna had resisted, until he showed up. The value of Jose Martinez on the roster keeps being brought up. Without a universal DH being implemented, how is this the case? This is now two straight years of a glacial pace with free agency. Last year, JD Martinez, Darvish, Holland, etc were left without deals well into spring training, and some of them it truly damaged their performance. It took Holland forever to get right with Washington, and Darvish broke himself. I know Goldy has mentioned being less than thrilled with how free agency is going lately, especially with Harper, Machado, Keuchel, and Kimbrel all needing homes. Do you see this trend potentially forcing a work stoppage? And now that the cat is out of the bag, so to speak, is there anyway to rectify it? Of owners are now so analytics-based, is free agency even going to matter anymore? What happens when Trout hits the market? Or Betts? Most players can only count on that one contract to really cover the bulk of their earning potential. How long before they say enough is enough? Yes, labor storm clouds are gathering. This is a serious issue -- and it's not like front offices are going to change. So the union has to find a way to pry open the market again. That could be getting players to free agency younger, that could be players recognizing that maybe at age 33 or 34 or 35 they don't get the big contracts -- but they'll have access to them earlier. I was talking with an agent about this just the other day and suggested that maybe players should strive for a bell curve when it comes to salary, and not the constant incline, incline, incline that was the marketplace 10, 12 years ago. Players should be eyeing the owners and baseball with some skepticism and then use that skepticism to argue/negotiate for a better deal -- and that's what has a work stoppage on the horizon. Owners have little reason to change. They've made the system that they are now exploiting, and saw it coming. Did you feel that any of the rule change proposals were worthy of further discussion? The universal DH as a chip in CBA negotiations makes a lot of sense. Expanded roster makes a lot of sense. So much of the other stuff .... ugh. No. Which uniform number Jeff Albert, Stubby Clapp, and all the NRI have? stltoday.comRighthander joins Will Clark, Jack Clark, Eckstein and Whiten as wearers of the number. Ponce de Leon changes name but not number (62). If something happens to Yadi,I'm worried.Should I be? The Cardinals are better with Yadier Molina at catcher, yes. They are worse without him. They will definitely try with Paul Goldschmidt. That's the plan. They'll have discussions this spring with Goldschmidt and his agent to see the form an offer will take, and also to check what Goldschmidt's preference is as far as timing, and how best to have those discussion. They'll lay the groundwork for inevitable talks -- and what some believe could be a deal struck during the season. There has been no such plan or momentum in place with Ozuna. One possible con of the healthy scratch (at least from a length-of-game perspective): If the extra spots are all used by relievers, then a manager could always have eight well-rested guys in the pen -- which could result in even more pitching changes. Legit concern? Meh. Not really. It would hasten the game in a direction it hasn't already gone. So Albert Pujols is coming back to St.Louis this summer. The chances of him not playing or even being hurt is a real possibility. MLB would be foolish not to get him introduced to the St. Louis crowd at some point during the games right?